Vancouver can be a rather tricky place to make friends I've found. It's a pretty transient city, and really making friends as a grown up is always something weird to me. Especially as I don't work in an office, or with people other than toddlers....where do you find people? Luckily for me, I have met some awesome people here. Now if only I could convince them to stop leaving! My dear friend Julie and her wee family made the trip back to Edmonton yesterday, and we miss them already. 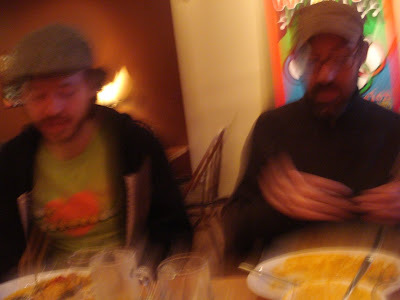 I love that photo up there, in all its out of focus glory, it's so indicative of our friendship. Lots, and lots of laughing. 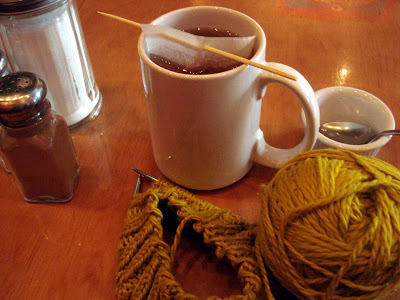 Sprinkled amongst tea drinking, feminist theorizing, knitting in public and a mutual love for....ok, food. Our two families have become extremely close over the short (since July last year, I think) time we've known each other. Even the shy husbands became friends. Love that. I also love more out of focus photography, because Richard's fingers look amazing. Just as I was getting excited about sunny days, dry weather and the possibility of wearing shoes and no socks, the snow decided to come back for a wee encore. While it was quite pretty seeing the city dusted in white this morning, really all I could think was that my feet were cold! These are a few things keeping me cheery while rapped up inside. Oh tea, Earl Grey with vanilla bean. Could it get any better? 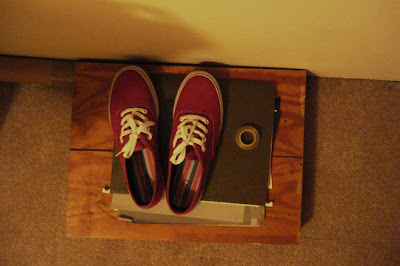 New red shoes picked up at cross the border shopping trip. Art supplies never fail to make me happy. 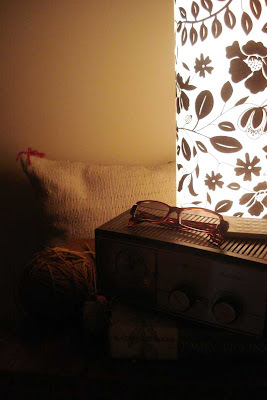 A cozy bedside with yarn and Emily Dickinson. Hearing this song in a store recently sure brought back some memories! This was one of my favourite movies when I was younger (Oh Lou Diamond Phillips, come to me in a dream), despite being sure it was pretty scandalous with some kind of raunchy shower scene at the beginning that I most certainly was not meant to be watching. I was so sophisticated I could hardly stand it. So naturally, when I was at some kind of community fair and there was a karaoke competition I knew exactly what I would sing to wow the judges. The fact that I didn't actually know the words or speak Spanish didn't bother me at all. However.....once on stage I quickly realised that 'Ba la la la la la bamba, spaghetti and meatballs, and maybe a pizza' wasn't going to cut it. 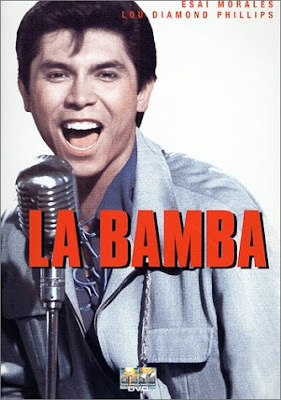 I do realise that La Bamba is Spanish that those various foods are not, but I think the limited experience of 'foreign cultures' outside the Pacific at the time meant that to my 7 year old self, Italian and Spanish were one and the same. Needless to say, the teenager (she was probably only 12, but seemed much older to me) who sang 'Like A Virgin' ended up winning. This is the new drawing I did for the moleskine exchange. I wasn't exactly sure what this particular moleskine's theme was, but there were cute little houses glued in the front so I went with that. 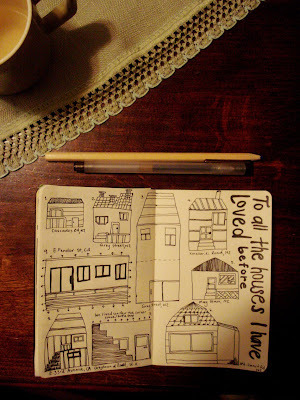 It's not quite all the houses I have loved before, but they wouldn't all fit. These are the ones I could remember well, or that had strong nostalgia attached to them. 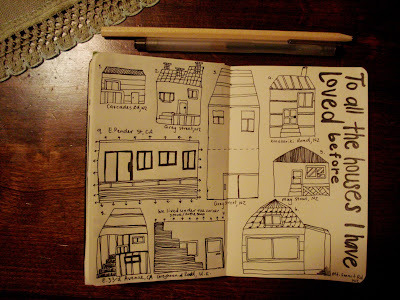 I love that when I look at drawings of houses, I still see faces. 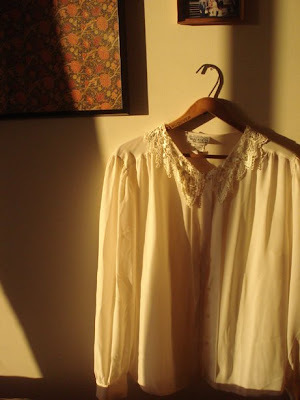 I couldn't resist using the afternoon sun last Friday, as the backdrop of this beautiful lace collared blouse I found while thrifting recently. I was so excited to find this. 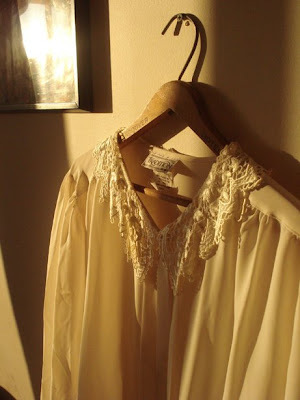 A perfect fit, lovely and light and floaty and the collar kills me. 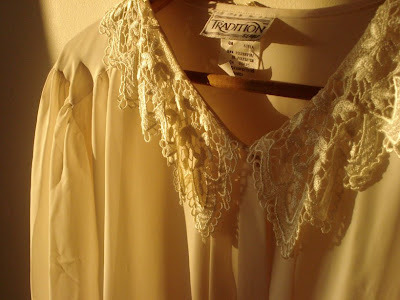 It isn't too high a collar which is often what I find with blouses like this. The high collar does me no favours whatsoever. 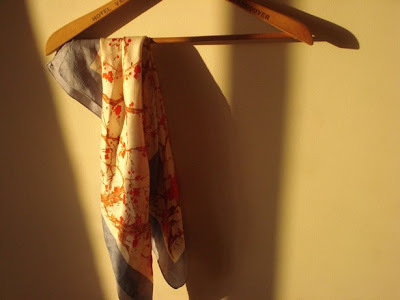 I also picked up a couple of pretty Italian scarves for a dollar a pop, that I'm looking forward to wearing with some Spring outfits. I'm really willing Spring to appear, despite me just seeing that the forecast for this Wednesday is....snow. 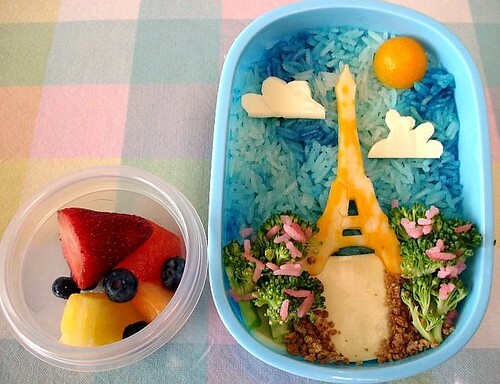 Tour Eiffel Snack Bento, originally uploaded by Sakurako Kitsa. I stumbled upon this while browsing flickr tonight, and all I can say is....amazing. My favourite part is that this is an actual snack! Oh, and the clouds. For more food fun go here. This one and this one are by far my favourites. 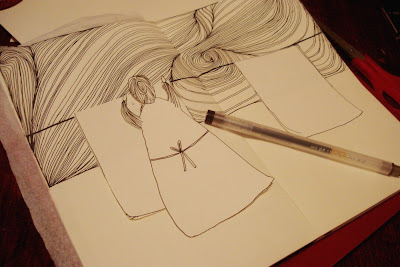 Thank you all so much for your lovely comments on my moleskine entry! It does slightly terrify me showing off art work that I've done. Like the feeling of reading past entries in your diary (that kills me). It feels so much more vulnerable than knitting or sewing, and has always been something I have felt inadequate at but really enjoyed. So, in short, thank you for the encouragement! It was lovely and sunny here today, so I took the opportunity to work out on the balcony to the sounds of the always wonderful Vashti Bunyan. 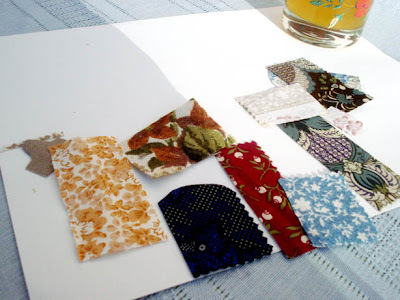 No drawing this time, but a small fabric collage for a new project I am working on. Excuse the frumpy clothes. It is Vancouver after all, so got cold within about 15 minutes of me being out there. 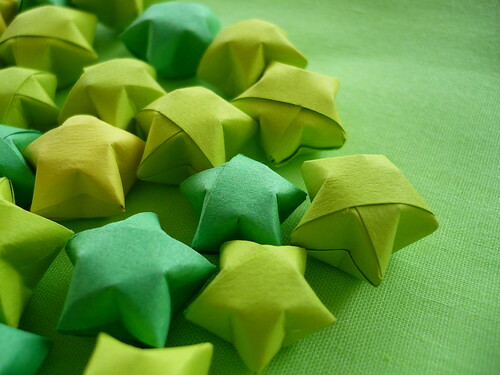 Origami Green stars, originally uploaded by stopglobalwarming. While enjoying a pot of Earl Grey at Cafe du Soleil yesterday morning, I watched as a Japanese woman taught her two young grandchildren the art of origami. They were still quite little, but were already getting the hang of it, doing a much better job than I know I can. It was so lovely to be able to watch a tradition being passed down, and a family enjoying creativity together. Folding paper to make something beautiful has always appealed to me. Somehow so simple and intricate at the same time, with the act of folding being art in and of itself. It is something I haven't ever really learnt how to do, save for the christmas decorations I made last year. 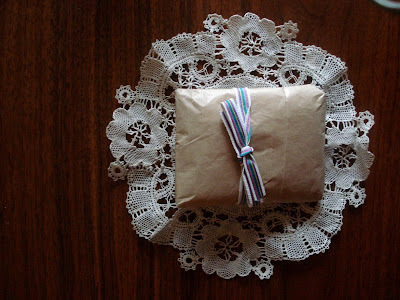 I do have some origami paper stashed away though, so I think I must bring it out and have a go. Have any of you tried it? Do you have a favourite object to make? I'd love to hear about it if you do! Our days thrifting have produced some real treats lately. I'm loving this orange gym bag, which will come in hand as a doula bag and holding snacks, heat packs and essential oils. I also love those little Norwegian....gravy boats? We're not actually sure what they are, aside from being pretty with a fantastic motif winding around them. 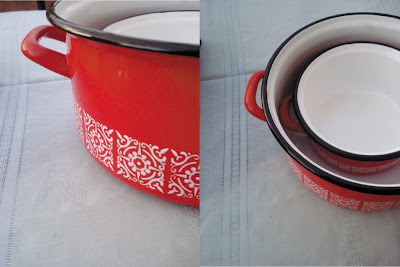 Speaking of fantastic motifs, we also picked up these lovely red pots. Nice and sturdy so practical for the kitchen, but really I just love the red and white. 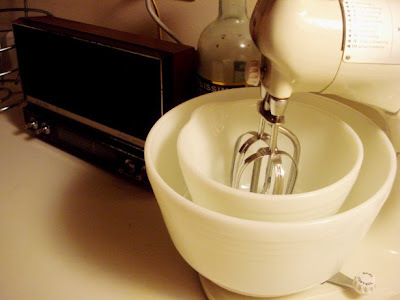 This mixer was probably the most exciting find. We have a great moss green Sunbeam Mixmaster, that I really try to pretend works...but it really doesn't. Our new Hamilton Beach works like a dream (now that Richard has cleaned the insides out and it doesn't smoke anymore...) and the Pyrex mixing bowls are so nice and heavy. 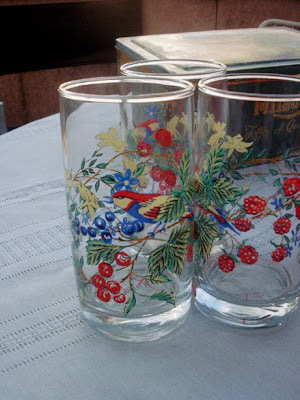 Finally, I can't wait to sip lemonade from these glasses while lazing about on the balcony this summer. Ice cubes clinking, and all that. 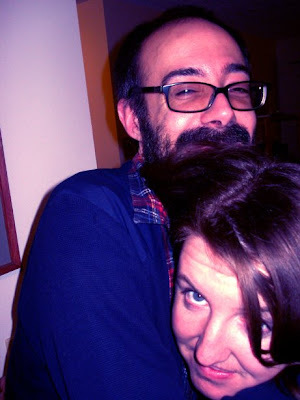 We aren't huge Valentine-sy people, and while I completely agree that it has become over commercialised and that I don't need a specific day to show Richard I love him, it is still nice to be nice. I like to think of it more as a day where we remind ourselves of all the people and things that we love to do, and to celebrate that. Not just romantic love, and definitely not Hallmark and roses with babies breath (oh, babies breath how did you turn so tacky) kinda love. But just love. For our partners, for our children, for our friends, for our planet. 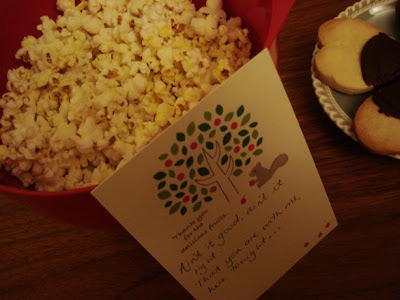 I also like to think of it as a day where I sit on the couch with my love, popcorn & treats. He brought me some Rockets Love Hearts home from work, which I have a secret love for. Speaking of secret loves, the wee quote on the card is a line from an oh-so-guilty-pleasure of ours, that I will now share with you all. Alrighty, I'm off to spend some more time with my love.....and Tammy Faye. A friend and I were chatting recently about being our own bosses, and while in so many ways this is a very good thing, it can be tricky to stay motivated. Ok, maybe not motivated but focused. The internet often draws me in and never wants to let go/I dont want to let go of all the great blogs, etsy showcases, news videos and youtube funnies. Anyway, this friend reminded me of the saying "If you want something done, get the busiest person in the office to do it". Later that same day, I was reading what Sarah of The Small Object was saying in the Handmade Nation book (which is excellent by the way). "Its those same people who stop just talking about x,y, or z, but actually get it done and work hard to make it happen and obsess over it, who succeed." I don't just want to be a talker! This led to the 'Giant To Do' list, and I am happy to say, also a incredibly productive week! I crossed a number of things off my list, applied for a small part time job at a company that I love, and also planned a trip to Boston at the end of next month to attend WAM! (Women in Media conference). I am incredibly excited by that last one! I have also recently joined the Vancouver Craft Mafia, and it is such a treat to be working with a group of such talented women! There are lots of exciting things coming up this year, including us working with Got Craft? 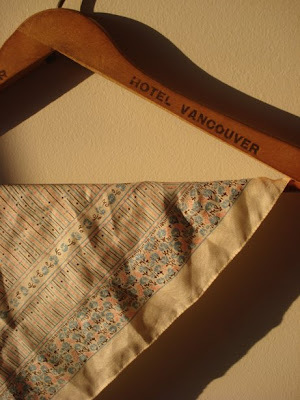 to put on the next Vancouver Swap-O-Rama-Rama. I had the pleasure this week of working on a new, craftier logo for VCM and I am excited to share it with you all when it is done. Finally, I have worked really hard this week on building a website for my doula business. I have also made contact with with some lovely ladies who are interested in working together and supporting each other as doulas. I have really enjoyed being busy and working with people who inspire and motivate me. Also, in short I think that poster up the top there really sums it all up. 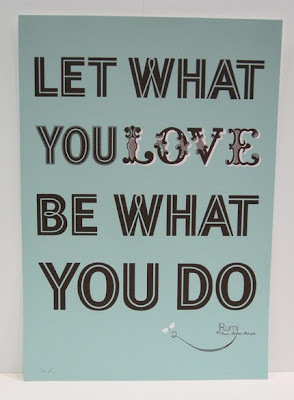 Making what you love (craft, community, birth/doula-dom, feminism, baking shortbread) be what you do. Here is the finished product from this post, where you got a bit of a sneak peek. I am quite happy with the results! 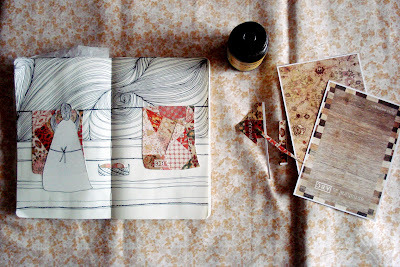 I used some beautiful postcards my friend Anna gifted me, I think from when she was working at the TATE that were just perfect for collaging the crazy quilts blowing in the breeze. 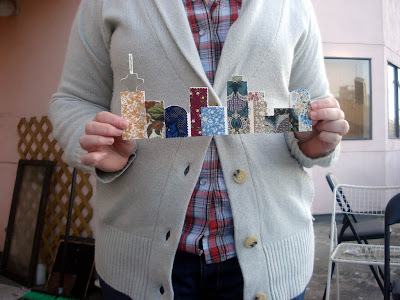 Speaking of collage, a few people have asked me about the teacup you see up there in my header. I must admit that isn't my handiwork, but was a little something Richard made for me awhile back when I was trying to figure out business card ideas. I love it and am so happy for it to have found its way into my header. Such a clever boy. Here I am trying to stop him from going to work last night, and stay home to eat popcorn with me. I'm sure many of you are aware of the horrific bushfires that are affecting Victoria, Aus. right now. Bushfires are definitely not out of the ordinary in an Australian summer, but the gravity of what is happening now as well as the possibility of arson being a cause, is unlike anything seen before. You can find more information here. Although I grew up in New Zealand, I am Australian by birth and still have family there. 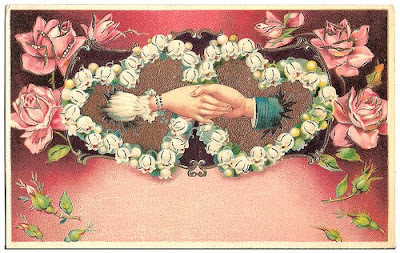 I also read quite a few Australian, and specifically Victorian blogs, and consider them my friends. 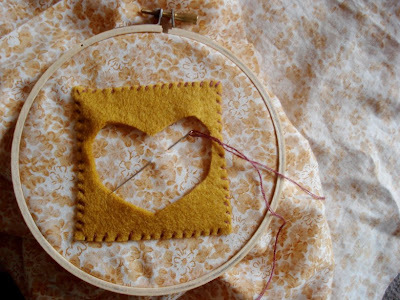 There are many ways you can help, from donating to stitching. The blogging and crafting community is an amazing resource in times like these, so please take a look around and either donate or buy a little something to help out the people of Victoria. Hollie from Vegan and Vintage is donating 50% of all sales from her etsy store to Wildlife Victoria, for the month of February and possibly longer. She also has lots of great info about animal safety, and where you can donate. 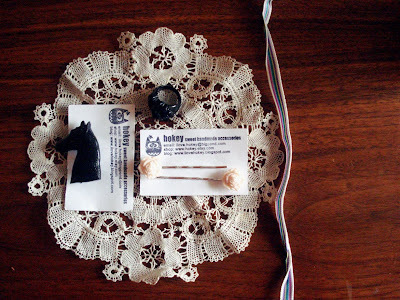 I purchased a lovely horse brooch and some sweet rose hair slides from her this morning, go check her stuff out! There is also a Handmade Help blog, where you can bid on various items or find out more about how you can help by making....or buying what others make. Also, I think if you go onto etsy and search 'Bushfire' you'll find what crafters are selling in order to donate. 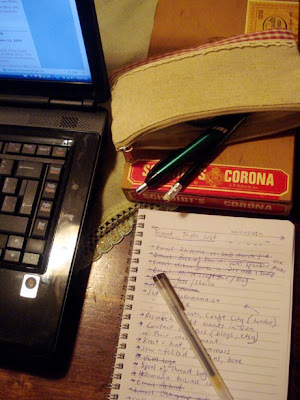 Both Evie and Jodi have some great lists and links on their blogs, and of course Pip has many awesome ways to help outlined on her blog. Madness '7' Tour - October 1981, originally uploaded by © AK Foto. I'm joining in a game from over at Mike's. Head over to flickr, punch in a year and see what comes up! I love this photo, so full of excitement. It totally captures the feeling of being young, hanging out with friends, going to shows, late nights and road trips! I wonder what you will find, with your very good year? I have been tagged by the lovely Jodi of Che & Fidel, my sweet friend down south. The idea is to open the 6th photo, in the 6th folder on your computer, blog about it and tag six others. I love that in the couple other posts I read who did this, people found forgotten treasures that made them smile. Just like this one I found. 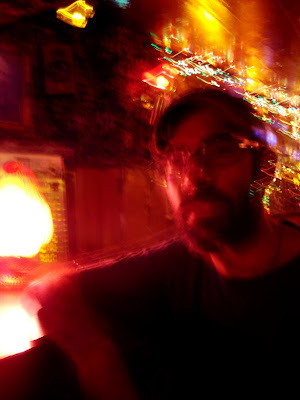 It was taken in August '07 in Berlin at Kumpelnest 3000, one of the most out of control bars I have ever been to. Formerly a brothel in the 70s, it has kept all it's original decor including double doors covered in fluffy flame patterned fabric, a smashed-up-put-back-together mirror, rainbow lights, many kitschy photos and a whole lotta velvet. Reading about it in the Lonely Planet, we definitely couldn't pass it up, and thank goodness - it was such a treat! After walking through what seemed like an industrial/officey type area we found the place almost totally empty save for an old guy sitting in the corner in a suit (flared pants of course) made entirely out of yellow, green and orange plaid, and our bar tender in his crocheted muscle tee. I kid you not. 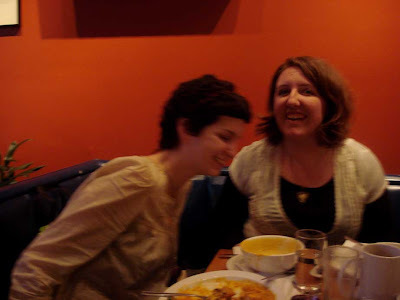 Haha, oh it was such a fun night and many, many photos were taken (lots where we tried to sneak the plaid suit guy in) as we listened to funk compilations (played on a cassette player) and chatted to the bar tender about 'his girls' and thrifting. Apparently, from what I can tell from the photos on the website, we were there on a very quiet night. I taaaag, Julie, Kate, Evie, Pip, Nina & Kerri. 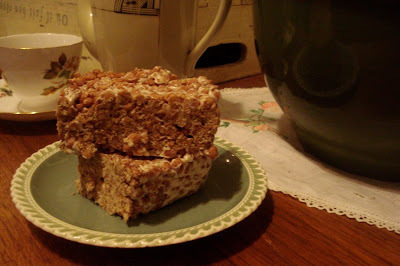 Rice crispie squares are one of those thing where I can't quite tell if you're still allowed to love them as much as I do, now that I'm an adult. I actually hadn't had them for awhile, until our co-op potluck where I snuck back up to the food table....oh, about 5 or 6 times to grab another piece. Its so freakin' good! Especially since over here its usually made with marshmallow instead of honey. This was made by my (other) favourite (with vegan marshmallow, no less!) who came over for a night of roast veggie soup, apple pie, knitting and Summer Heights High. What a treat! I didn't really make any resolutions this year, but I have definitely thought about a few things I'd like to make an effort to do in 2009. One is to create something, or a part of something, every day. To be creative every day. 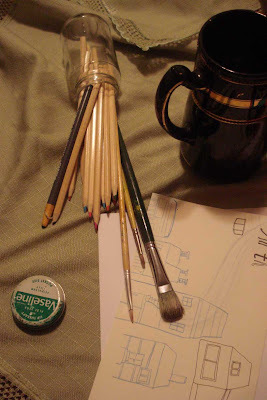 Theoretically if I want to get going on establishing a craft business, I should be doing this anyway, but I really want to make sure that I am not only doing this just for work but instead just simply to be involved creativity. 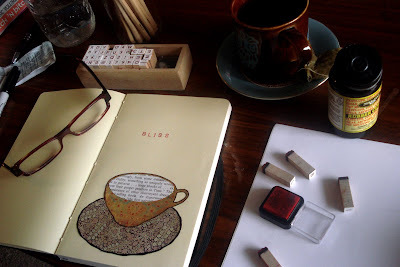 One way of doing this is a moleskine (oh how I love these books! )exchange I'm currently taking part in. The idea is, each person has a moleskine and it gets sent around the group where each member gets to illustrate a double page spread. 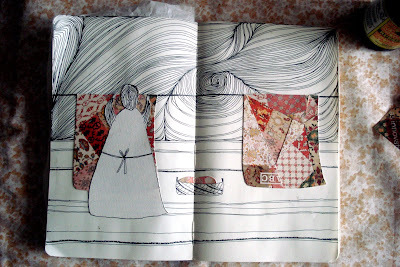 Some people have set a theme for their moleskines, others have given the illustrators total freedom. The group is really diverse, full of wonderful women, a range of different ages, locations, professions and aesthetics, so I am really excited to receive a book back full of art from all over. Here is a quick peek at what I'm working on at the moment. There is still some collage work to do, but I'm actually pretty happy with how it's all going so far. What ways do you like to engage in creativity? Enjoy the start to your week, and for all my sweets down under I hope you are keeping cool in the crazy heat!